Nothing spells luxury in the automotive world like those three little letters – BMW. Bavarian Motor Works has been putting out luxury vehicles for decades, and auto lovers around the world continue to appreciate the finer things in life through BMW. And, even though they were a bit late to the Sport Utility Vehicle market, they have steadily released a stream of the highest quality SUVs since 1999. One of these, the BMW X3, is among the most desirable in its class. And, whether new or used, BMW X3 crossover SUVs retain the luxurious appointments and top of the line engineering you would expect from BMW. The BMW X3 was first released in 2003 and is currently in its third generation. As with all vehicles, SUV or not, a natural evolution occurs. One of the bigger jumps you will usually see between generations is between the first and second generations. This is typically where the automakers have a pretty good sense of what works and what could work better. They have had years of tweaks, test drives and consumer feedback to give them an idea of where to go moving forward. The second generation BMW X3 is no exception. This crossover SUV saw many improvements over its immediate ancestor. Some were in aesthetics, some in performance, some in the rapidly changing technology of the late 2010s. Read on to discover more about the second generation BMW X3 and see if this sounds like the used BMW you need. If it is, we invite you down to McCluskey Auto to see this ultimate example of German engineering in person. The 2011 BMW X3 was the first model year for the second generation of the X3. It featured two trim levels, each with unique engines. The xDrive28i was the first trim level, and it came with a 3.0 liter inline six-cylinder that got 240 horsepower. The xDrive35i, on the other hand, got a 3.0 liter turbocharged inline six-cylinder that could produce up to 300 horsepower. These were the only two trim levels and the only two engines available on the 2011 year model. Both engines were paired with an 8-speed automatic transmission. The xDrive28i featured the base trim level features you would expect to find a BMW vehicle, such as dual-zone climate control, leatherette upholstery and 17” alloy wheels. The higher xDrive35i ramped it up quite a bit, offering 18” alloy wheels and Xenon headlights, among other luxury features. Since this year model was the first of the new generation, the 2011 BMW X3 naturally saw a slew of new standard features, as well as optional ones. Some of the standard features included a USB port, Bluetooth connectivity and BMW’s iDrive system. iDrive was not new in 2011, but it had never been a standard feature on BMW vehicles before that. iDrive is BMW’s voice activated navigation and infotainment system, which allows instant access to music, directions, phone service and more. While that sort of connectivity is almost ubiquitous in 2019, it was not as prevalent in 2011. The 2012 model for the BMW X3 was virtually identical to the 2011, the only real difference coming in a slightly higher MSRP. The 2013 would follow suit in that regard, only offering a slightly more powerful base engine. This inline 4-cylinder would get the same 240 horsepower as the 6-cylinder featured in the 2011 and 2012, but would wrench up the torque from 221 lb-ft to 260 lb-ft of torque. It also got slightly better gas mileage, going from 25 miles per gallon highway in the 2011 and 2012 engine to 25 miles per gallon highway. As far as the standard and optional features were concerned, they remained largely in the same ballpark as the previous year models. The 2014 model would feature the same base inline 4-cylinder as the 2013 offering but would offer a few more features as standard, Both the 2013 and 2014 models upgraded from 17” wheels to 18” wheels, as well as both having the slightly more powerful inline 4-cylinder engine. However, the 2014 model would also add a few more features as standard, such as a third 12 volt outlet, an auto-dimming rear view mirror and two seat-back storage compartments, which were previously only available as an added feature. The 2015 model saw the biggest changes in the second generation. This year featured the previous two engines, the inline 4-cylinder and the turbocharged inline 6-cylinder, but added a turbocharged 2.0 liter inline 4-cylinder diesel engine. This engine was previously available in European markets, but not North America. It offered 180 horsepower and 280 lb-ft of torque and also gave drivers the best fuel economy option with 30 miles to the gallon combined. On top of the new engine options, the 2015 model year got a mid-generation facelift. Exterior changes included new twin circular headlights, new bumpers on the front and rear of the X3, a redesigned grille, larger exterior mirrors with integrated turn signals and a redesigned kidney grille. This model year also gave BMW drivers a few new interior updates, such as new cup holders, interior trim strips and upholstery designs. In 2015, BMW embraced the fact that they had both a luxury vehicle and a luxurious SUV with the X3. Most car aficionados would balk at the idea of taking a BMW anywhere that could even require an unscheduled washing, much less something as strenuous as off-roading. However, BMW drivers are an adventurous sort, if nothing else. The 2015 model introduced two new optional packages. The M Sport package offers sport-tuned suspension and steering, 19” or 20” wheel options, sport front seats, and other aesthetic tweaks for a sportier look. This was designed to appeal to the more outdoorsy type. The xLine package, on the other hand, added even more of the luxury appointments on the interior, such as satin aluminum side cladding, premium leather upholstery choices and refined interior trimming, among others. After the redesign of 2015, BMW scaled back the changes for 2016 and left well enough alone, for the most part. The one thing that was a significant upgrade was a complaint that they had received multiple times, and that was for the sound system. BMW drivers were surprised and disappointed that a luxury vehicle such as the X3 had a sub-par stereo system. BMW addressed that by installing a Harmon Kardon premium stereo system as a standard feature on the trim levels that had 6-cylinder engines. The 2017 version of the BMW X3 would be the final year of the second generation. It retained the powerful gasoline engines of the previous year models, but sent the diesel engine into a brief lapse and made it unavailable. This is because BMW was working on several new engine options for the upcoming third generation. The major improvements came in the technological department, with BMW adding a wireless charging station and a WiFi hotspot as standard features on the X3. Instead of simply waiting for the next generation to come out the next year, BMW went ahead and redesigned the iDrive system for this year model, as well. It improves upon the efficiency of the navigation and connectivity already found in the iDrive and makes for a more seamless driving experience, especially when having to use those features. It also offers a head-up display, which shows important information from your dash (speed, gas tank, direction, etc) as a display on your windshield. It also offers Apple CarPlay for instant access to the music, podcasts or navigation on your iPhone, if you prefer to use your own iTunes or Spotify. All in all, the second generation was a much-needed improvement to the first generation. BMW went out of their way to make the X3 larger and sportier, making it nearly as big as the X5, but still retaining the feel of the luxury crossover. The best news of all is that now that the third generation is hitting the roadways, the second generation is available at hugely discounted rates. The third generation was released in 2017 for the 2018 model year and features even more updates. However, the second generation is a perfectly good luxury vehicle, especially for someone looking to buy used or certified pre-owned. One thing to note: BMW has not yet offered a hybrid of the X3. That is expected in 2019. 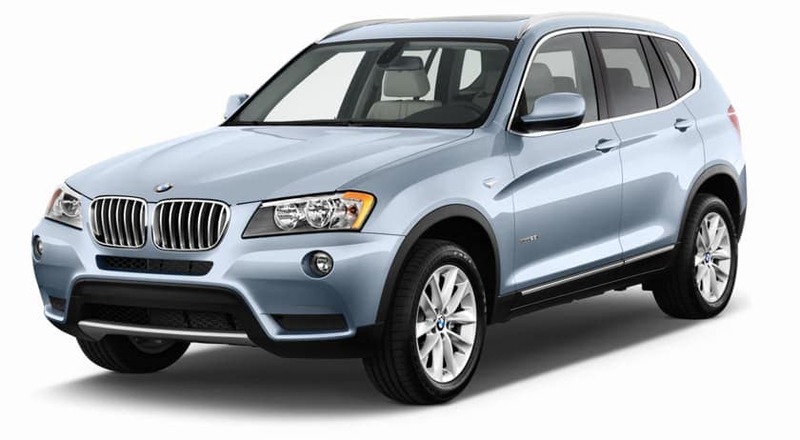 If you are interested in a used BMW X3, and you should be, we invite you to come down to McCluskey Auto in Cincinnati and check one out for yourself. These amazing vehicles sit at the top of the luxury food chain. And since BMW has always been ahead of the curve when it comes to amenities, the technology you will find in a used BMW X3 is comparable to what is on today’s newer vehicles. We would love to show you around the second generation BMW X3. Our sales staff will be happy to answer any and all questions you have about this luxury crossover. We can show you all of the features, including plenty not mentioned above. We will see you soon!